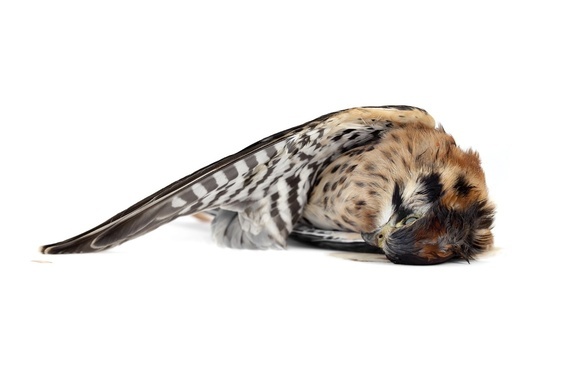 Readers in Los Angeles can see the dead bird photos of Susan Silas in the exhibition eyes wide shut at the CB1 Gallery, 207 W. 5th Street, from April 9 through May 15th. A reception for the artist held at the gallery on Saturday, April 9, 5-7pm, is open to the public. Susan Silas, eyes wide shut, 2010, from the series, found birds, 2000-the present, 22x17 in. archival ink jet print on Hahnemühle photo rag. The deeper meaning of serious art often comes to light only after considering the work in tandem with the larger body of an artist's production. 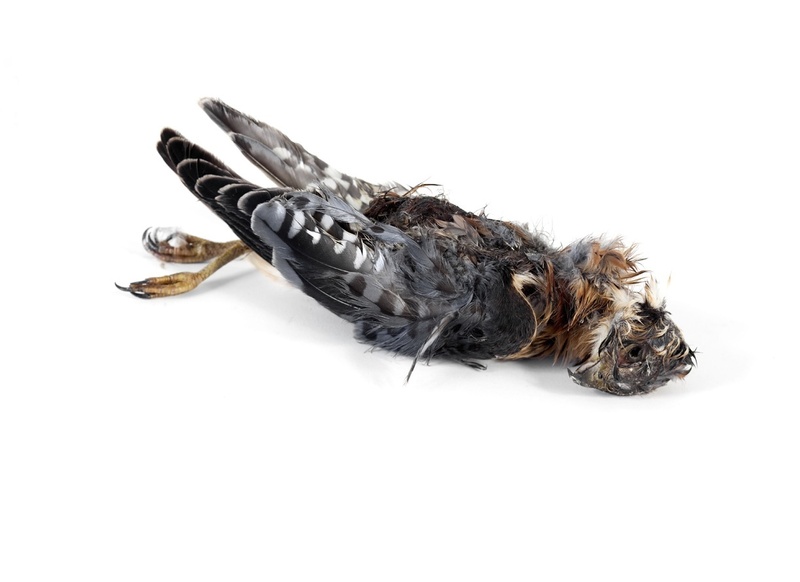 Susan Silas' series of photographed dead birds in various states of decay presents a singular case in point once we explore how the artist's brightly illuminated, exquisitely feathered corpses take on a surprisingly cathartic function in our need to mourn and to moralize. It's no overstatement that Silas's dead birds have the capacity to draw out all the lachrymose sentiments we humans endure with deeply personal loss. For as the history of art informs us, and as the photography of Silas attests, the metaphorical power of birds is capable of bearing the magnitude of loss imposed by genocide and cultural erasure. Viewed alone, Silas' dead birds easily draw our admiration and empathy, but their capacity for signifying greater tragedy only becomes resonant upon considering how the series euphemistically echos an earlier body of Silas' work. 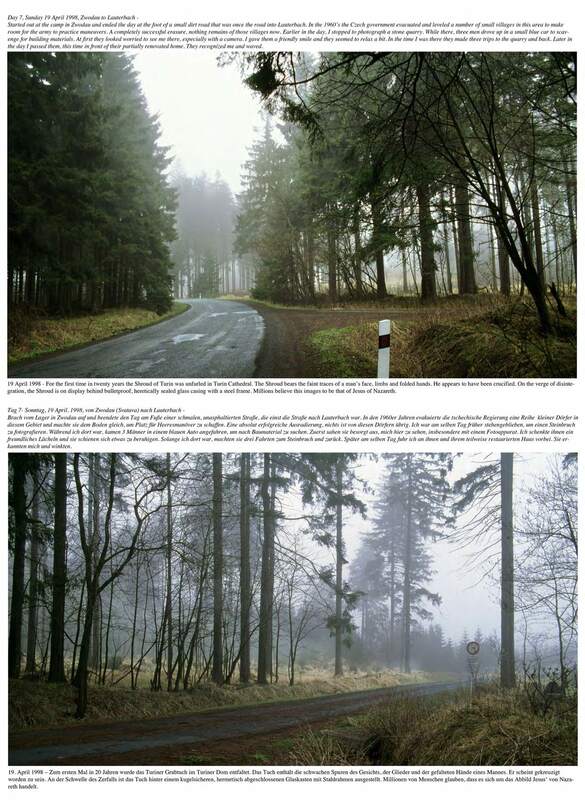 Helmbrechts walk, 1998-2003, is a series of photo inkjet prints in which Silas has conjoined image and text as the final document of the artist's project of tracing on foot a 225-mile route from southern Germany through the Sudentenland (now the Czech Republic). It's the route that, in the spring of 1945, 580 women concentration camp prisoners, a number who were Hungarian Jews, were made to march at gunpoint by the Nazis. Ninety-five of the women died of exhaustion, starvation, or were shot by their guards in the last days of the European liberation. 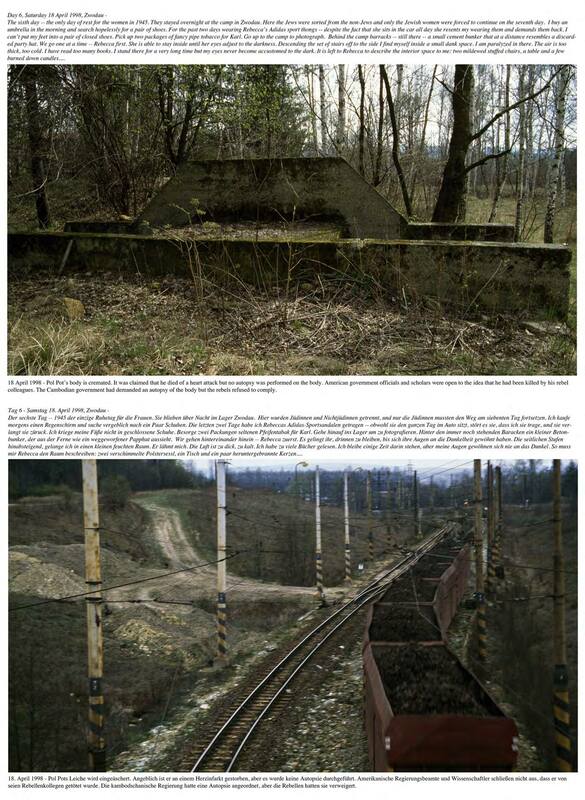 Beside showing us the striking, bucolic terrain withholding all trace of its sinister history (neither a sign nor a monument anywhere commemorates the women or the march), Silas' depictions of the contemporary route compose the closest approximation to experiencing the last views greeting the female Helmbrechts prisoners. It's no academic exercise; the work bears the inconsolable weight of Silas' persecuted ancestry. Prior to and during the Second World War, half of Silas' family, all Hungarian Jews, perished under the Nazis, many in concentration camps. Susan Silas, Helmbrechts Walk, 1998-2003, archival ink jet print on Hahnemühle photo rag. 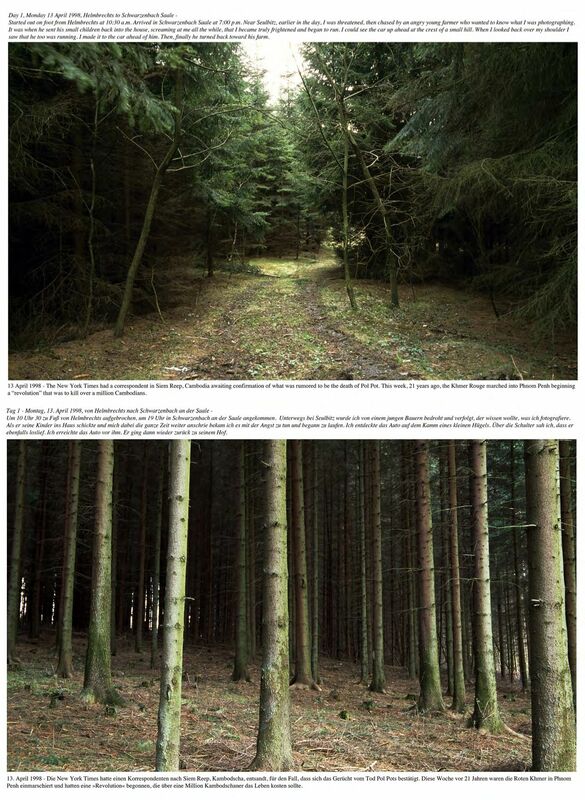 To read the text embedded with these landscapes, see the blockquote passages directly below. Silas doesn't announce the connection between human suffering and the dead birds, but when considered in dialogue with Helmbrechts walk, it's hard not to see the stark imagery of the birds relieved of all suffering composing a eulogy for the women who walked to their deaths, as well as to holocaust victims in general. And of course, the work extends itself to all victims of criminal abuse and terror, if for no other reason than the motif of birds conveys the most widespread analogy to the human soul in cultures around the world. The motif of dead birds may seem a fragile vehicle of catharsis before such a hideously dark side of human existence, until we realize that the decaying birds together with the verdant landscapes remind us that all nature and history are answerable to such all-encompassing principles as eternal demise and renewal. How can the dead birds we see laid out so peacefully possibly embody anything but what we understand as a final passage necessary to prepare the way, make room for, and in their final decomposition help to nourish the succeeding generation? Even without seeing the dead birds in conjunction with Helmbrechts walk, upon prolonged viewing of the birds' final composure, as upon reflection on any dead thing, we can't help but fixate on the role that we play within the scheme of creation and destruction. It's not just a narcissistic reflection or mythological turn of mind. If anything, both Silas's dead birds and her commemoration of a trail on which women march to their deaths opens the way for the flood of solemn questions and inferences ultimately rendering individual concerns inconsequential, if not absurd, when posed against the overarching and inviolable forces of politics, history, evolution, and ecology. In short, Silas analogizes suffering and death as events necessary to the perpetuation of life while transcending all species according to the dictates of nature. In this sense the dead birds are exquisitely elegiac of the natural progression of time and nature because of their fidelity to scientific observation and principle. And yet, despite the factual nature of science offering us some measure of consolation and closure in the face of our own demise, science fails to answer the relentless and yawning questions that haunt us after living things fade away--especially the tragic and criminal demise of mass murder and genocide that gnaw on human intelligence and empathy for generations after. Of course, even in considering the simple, easy death, there is no explaining away the questions innate to the structural contextualization of human death to the larger array of living and dead things. The mystification that floods in the voids left by unanswered questions isn't to be mitigated. At best we can cease elaborating myths to cover for the mystery, and this is the minimalist recourse with which Silas frames her dead birds. Unless we consider the easy death of birds as a key to acquiring the redemption that humans crave. Anyone having experience with birds, or at least anyone who has witnessed birds in the throes of death, also knows how easily and quickly birds die upon encountering adversity or capture. Put a small bird from the wild like those Silas photographs in a cage, regardless of how well it's supplied with food and water, and it will be dead within days, even hours. And who hasn't seen a bird caught by a cat going limp within seconds of its capture even without mortal injury inflicted and with almost no struggle. It's hard not to think of this propensity of birds for the easy death/escape upon seeing their exquisitely photographed carcasses alongside the record of Silas' Helmbrechts walk. How much more merciful the easy death of birds appears next to our own endurance of imprisonment and terror. Anthropomorphosized, it's such grace that has lent itself to the pronunciation of mystics that birds are the favorite creatures of gods. Concentration camps, torture, forced labor, suffering all monstrous inhumanities, even the consequences of our own resistance, would be unknown to us were we possessed of such final grace--making it tempting to envy the easy death of birds, were it not dangerous to do so. I say dangerous because in knowing as we do the repetitive and ubiquitous cycle of genocidal history plaguing civilization, wishing for the easy death can inhibit the defiant death that makes humans heroic. And yet being in possession of such an encompassing world view could prove a liability for a photographer. Photography, after all, isn't a medium suited to grandiosity. It's the momentary and the minutiae of the world that is enriched by photographic captivation and framing, not such all-encompassing motifs giving rise to mythology, spirituality, and cosmology. It's for this reason that photography's alignment with science is seen as instrumental in Silas' work. It certainly accounts for why science is as much Silas' subject as the birds she photographs. We understand this better when we consider that Silas could have chosen from two other artistic interpretations when representing death--the transcendental and the grotesque. But Silas chose the factual scheme of death, a choice given to the alternately calming and brutal representations of death relative to the viewer's proneness to emotional and aesthetic delicacy. And in so doing, Silas, confronts and challenges a central precept of art--that art by and large be envisioned as a means for staving off the human obsession with death, even rendering humankind immortal in historical terms. In the Pantheon of Rome, over the tomb of the great painter Raphael is inscribed the eulogy: "Here lies Raphael, in whose prolific life great Nature feared her works eclipsed, and in whose death, feared she herself might die." It's an inscription confirming the romantic belief that only great art rivals death. It's also the romanticism that Silas seeks to counter both in Helmbrechts walk and the dead birds' series by affording us instead with the resignation found in the unsentimental and thorough documentation of death and decomposition. In at least one sense, Silas' dead birds might be seen as an exaltation of finality over human consciousness, or as the process that will not relent in its intrusion upon all human concerns--an intrusion that levels even scientific photography before its unscientific and non-photographic enigmas. In this respect we can come to understand how the contemplation of death and decomposition modeled by Silas' dead birds implies that only aesthetics and ideology cement death's enigmas to science and photography. This sounds at first to be the same romanticism expressed over Raphael's tomb. 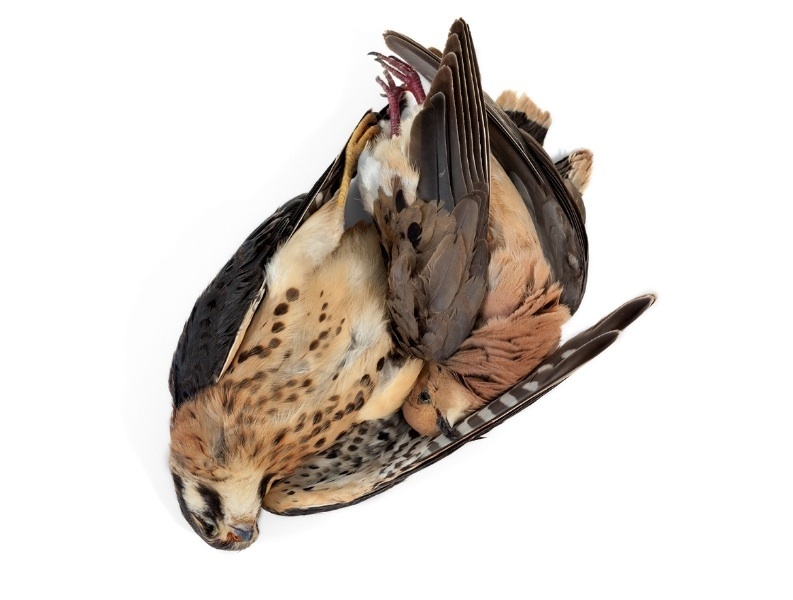 But unlike the romantic view, Silas's photography of dead birds doesn't exalt the human contrivance of art over nature as much as it seeks to integrate art with death. In her relentless pursuit of detail, Silas composes photographs of dead birds which both affirm and challenge all that has been rhapsodically written about photography's relationship to death: That photography is the memento mori; the relic; the participation in and simultaneous perpetuation of dying and death captured; the healing factor in our release of the poetic injuries incurred upon life by time--all issued by innumerable photographers and critics of photography before and, no doubt, after her. But whereas all this is true of the single photograph of a deceased subject, in tracing the death and decomposition of birds who individually have no sentimental value to viewers--the value of the photographs of dead birds is endemic of the species as a whole, of nature and ecology, not the individual subject depicted. It's the unremitting demise which Silas records frame by frame (though not all frames make the final cut, or in this case the final book of prints) and which ultimately ends without corporeal (or at least visible) trace. Silas makes photography the opposite of romanticism. Photography is a fact that, of all the arts, pays the least if any regard to what the photographer wishes. In recording decomposition, Silas makes the photographic process the ultimate arbiter of entropy--that which impresses the reality of finality on our minds without compromise. As when facing the absurd, when facing the finality of life, we have to surrender all our myths of afterlives and immortality to whatever endgame proceeds. Of course we always know this upon viewing a photograph of an historic living subject, but we more often walk away feeling reinforced with the overall conceit that we've somehow cheated death and nature by making a subject immortal. By contrast, in experiencing the demise of a subject in its various stages photographically, as Silas facilitates for us, we walk away feeling not the subject, but death itself has been immortalized. In this light, Silas signals that we cannot look to photography or to science in principle to establish human exaltation over nature or death. All of this leads to what can only be explained as each generation's artistic prerogative for poetically turning over its own variation on the truism that every representation of death reduces analogously, symbolically, finally, to the death of the self. Whether Silas has concerned herself with conveying information about the easy and gentle death and decomposition of birds or in providing a reconciling note to the cultural amnesia prolonging the destructive effects of torture and genocide, Silas' descent in the order of relevant species and phyla in nature from humans to birds is but an effort to anchor the human life to the greater cycle generating and justifying the sanctity of all living things. Viewed as part of the chain of life and death that humans share, Silas' dead birds account for why death, all death, not least of which counts the death of some species "lesser" than our own, holds for us a special fascination. Understanding such connections are structurally imperative to understanding Silas' work as a whole. In Helmbrechts walk, the mesh of meaning for Silas proceeds through her family and extends to history and contemporary humanity as a whole. The very structure of such a relationship to misery and death impels Silas to impress upon her audience the enduring will to obliterate all genocide--however insidiously resident the genocidal impulse may be in all societies and cultures, a factor that accounts for how and why genocide spreads and flares up at unforeseen intervals. 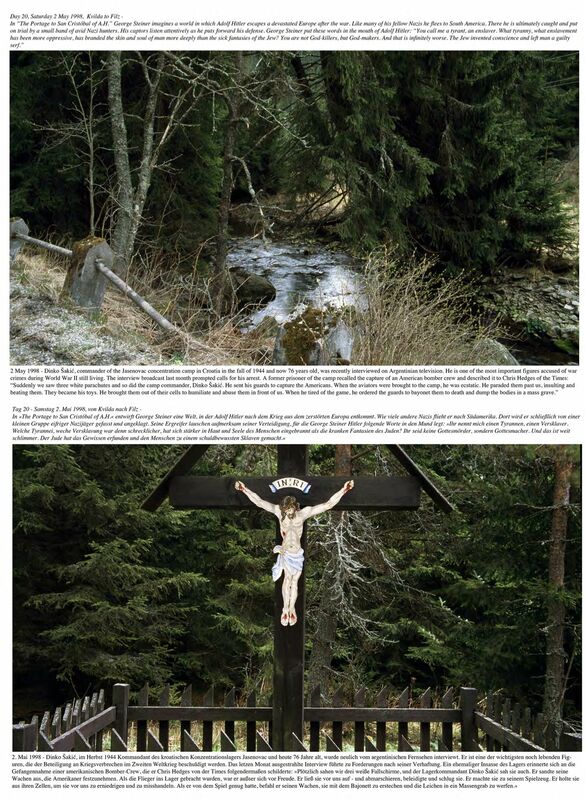 The chilling irony underpinning Silas' photographs of the enchanting German and Czech countryside strikes at our hearts when we learn that the beauty we are admiring is what today officially camouflages the trail of persecution and death. I've already alluded to the inability of Silas in 1998 to find any monument, sign, or plaque marking the landscape or commemorating the march of prisoners having passed in April 1945. Tourists and most resident Germans and Czechs will not acknowledge the horrible secret to which only a few scholars today attest. In such a context of cultural amnesia, it's not just history that compels our attention as much as it is the warning that our own deaths could come with as much hatred and horror at any given time. It took a decade after tracing the route of the Helmbrechts march and the part it played in the genocide of Jews and extermination of other "undesirables" for the wound of Silas's outrage to callous over into disbelief. No doubt her enterprise to photograph the death of birds is symptomatic of an effort to make sense of such horrific histories, considering that Silas is really composing a visual essay on all death. If it be birds that ultimately euphemize human death and decomposition in Silas' hands, it's for no other reason than that our fear of death, a fear necessary to life, overrides even our fascination with the death of our own kind, the deaths of the animals nearest to us in the evolutionary chain, and so on down the line. Then, too, it's too difficult for most people to sustain visions of the irremediable onslaught of decay. Our survival depends on human revilement of the decomposing corpse as much as it does the entropy that somehow draws us in to the two stages of death that somehow remain poignantly beautiful to us--the initial departure from life and the ultimate disappearance of all trace of that which once was an animated, vital, and special entity. The day's news item inscribed between the photos: 2 May 1998 - Dinko Šakić, commander of the Jasenovac concentration camp in Croatia in the fall of 1944 and now 76 years old, was recently interviewed on Argentine television. He is one of the most important figures accused of war crimes during World War II still living. The interview broadcast last month prompted calls for his arrest. A former prisoner of the camp recalled the capture of an American bomber crew and described it to Chris Hedges of the Times: "Suddenly we saw three white parachutes and so did the camp commander, Dinko Šakić. He sent his guards to capture the Americans. When the aviators were brought to the camp, he was ecstatic. He paraded them past us, insulting and beating them. They became his toys. He brought them out of their cells to humiliate and abuse them in front of us. When he tired of the game, he ordered the guards to bayonet them to death and dump the bodies in a mass grave." 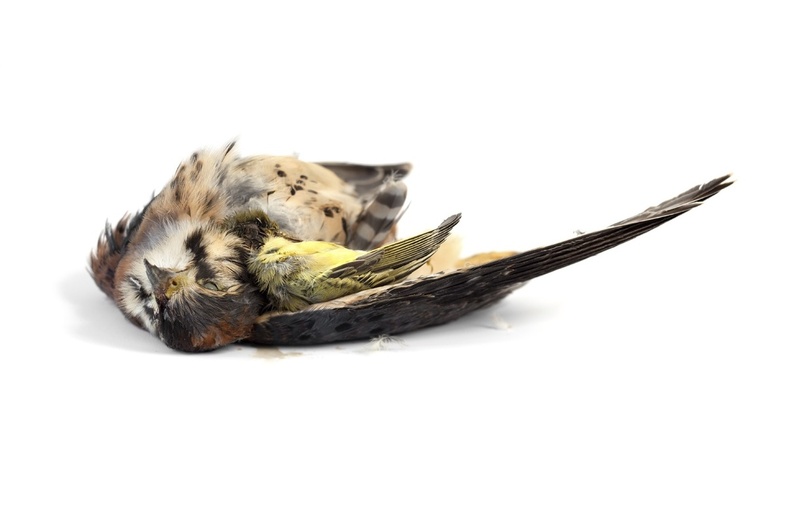 Silas' factual photographs of dead birds account for corporeal entropy in all its stages. It represents what is sustained ideologically in place of a faith in, and mythology of, the afterlife. It is an existential account of death's place in the circle of creation and destruction held by the secular- and empirical-minded viewer. In such respects, Silas affords an aesthetic alternative, though one only sometimes beautiful, to the evasive and mythic closure more traditional faiths facilitate. Of course, myth as much as science is elaborated because life is not homogenous; we experience interruptions, breaks in it. We feel compelled to fill the voids in our observation, whether it is with narratives of immortality or scientific paradigms that explain causation and cessation. Silas does her best to provide the detail required to minimize the mystification of death, but science can manage only a tentative imaging over of the void in the absence of an afterlife myth. Yet, even to accomplish this much in iconographic terms, Silas had to solve the problem of our revilement of corporeal decomposition. She had to find the humanly tolerable depiction of death that would allow prolonged contemplation of all physical demise, laced as it is with the undeniable and awful requirements of perpetual renewal. To put it in terms reflective of Silas's photographic process and subject, Silas had to find the entropy that would hold us enrapt, keep us from turning away. Here there is no contest. Of all animals, none preserve the beauty and dignity of death with a grandeur and longevity approaching that of the many species of birds. As any Audubon enthusiast could attest, the decomposition of birds, owing to the texture, refinery, and longevity of feathers, shields us from the harder facts of entropy, allows us to linger over the cessation of life at times to the very point of its disappearance. It is difficult to think of another class of animals so inclined to support human perceptual standards of beauty both in life and in death. Birds have long been the favorites of taxonomists for this reason. Just as Silas declined to assault us with historical images of Hungarian Jews corralled, emaciated, or piled up before gaping graves, she doesn't present a demise between the moment of death and the final disappearance so terrible we must turn away from it. And yet decay imposes its bleakness even on the grace of birds. Sometimes it appears in the early stages, when we can still recognize the forms of the birds we so love to look at and listen to. At other times decay overpowers us at its final stages, graphically impressing on us that only visual memory of the bird, and after that only an abstract consciousness of death, gets passed along the generations. But make no mistake. However much we preoccupy ourselves with the pictorial features of Silas' birds, the death and decomposition that she analogizes, and which holds each of us enrapt, is ultimately significant of the death and decomposition of the human self. The entropy that we find too brutal, too savage to behold, is the entropy we cannot escape in waking or in dreams. It is the entropy that defines how we respond to every representation of death regardless of the species, genus, phyla of animals. It is at the outset chilling to put such atrocities as genocide into a context that would level all that we love and hate--all reason and art, all civilization, all criminality, carnage, and war--to mere entities subject to the overarching cycle of decay and renewal, a virtual compost heap of nature/providence/God. The extreme anguish of doing so is what gives rise to spiritual faiths in all their manifestations. Silas has not as of yet produced a completion of the cycle in her work that attempts to articulate models of possibility after death. But the compost theory of destruction is more than implied in her photographs of dead birds. We are seemingly led right to the precipice of that which we cannot speak. That is, until we realize what any gardener or agriculturalist could tell of--that it is the compost made from dead things that makes possible the next season's growth and our own nourishment. It is in this sense that Silas's photographs of dead birds hold out significations of the hope and healing we all require to carry on. That and a resignation to the greater force of things beyond us. 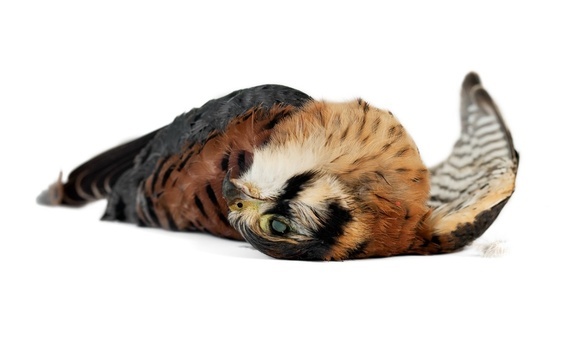 Susan Silas, eyes wide shut, 2010, from the series, found birds, 2000 - the present, 22"x17", archival ink jet print on Hahnemühle photo rag. This post was reformatted on 5/27/16 in response to the new Huffington Post format. No content or images were changed.